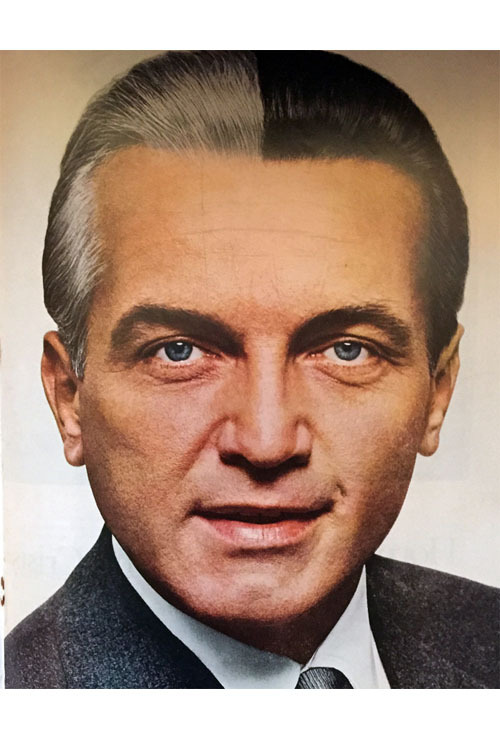 Looking through an early 60s LOOK magazine - the Hunt’s Catsup to Life’s Heinz - I came across an ad for men’s hair dye. The copy said that grey hair made you look old, and not so virile, and not as ripe for Success as dark hair. Here’s the picture they used. Is that who I think it is? Because silver hair didn’t exactly sink his career. The message, which to teens translates to “these hashbrowns are on point (very good),” garnered almost 30,000 retweets and was seen in the advertising industry as something of a social media marketing masterstroke. Taco Bell and IHOP later sent out their own tweets using the phrase “on fleek,” looking to get in on the action. Suggestions poured out, including “99 problems but lunch ain’t one” and “big shrimpin’,” both references to classic Jay Z songs. Can we draw a connection between our menu and a famous song about a man living off the sexual exploitation of women? Anyone? C’mon, we’re losing the Millennials here. Mr. Niccol said he misspoke, adding that Taco Bell does an “amazing job of tapping into” the Millennial voice. One day the Millennial voice will grow up.